Chile's indegenous community of Pehuenche Indians have found rare political support. 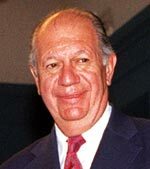 President Ricardo Lagos absented himself from the inauguration of the controversial Ralco dam, 500 kilometres south of Santiago, on September 27, 2004. The biggest hydropower plant of the country became operational after an eight-year-long legal battle over indigenous land rights and environment. Environmentalists welcomed Lagos' move whole-heartedly. The debate over Ralco began in 1989 when the construction of four dams over the Bo-Bio River was announced. Environmentalists said the decision flouted the country's 1994 environment law and a legislation on indigenous rights passed in the early 1990s. The land to be used in Ralco's construction belonged to the Pehuenche Indians. Lagos, who is a socialist, visited the dam on September 10, 2004, and met Pehuenche families. He later announced he would not attend the inauguration. Berta and Nocolasa Quintremn, the sisters who symbolised the legal battle waged by displaced Pehuenche families, were also absent from the function. But Lagos' predecessor Eduardo Frei was present.